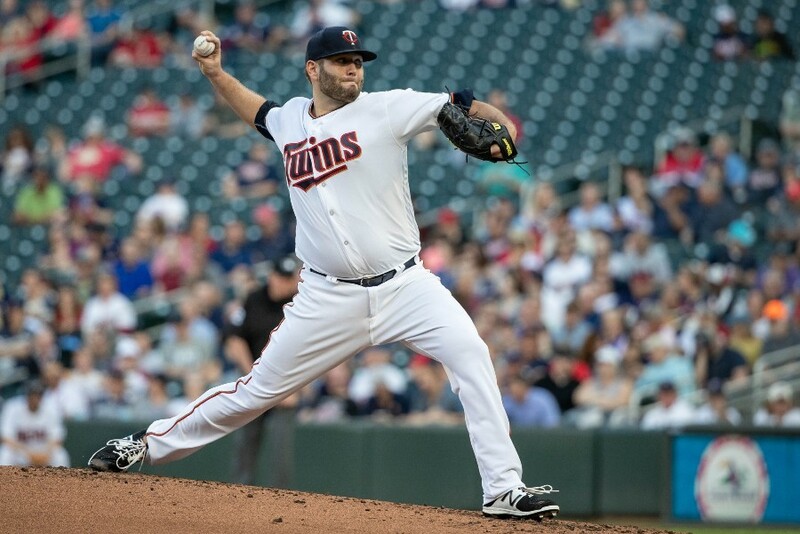 Lance Lynn pitched his best game in a Twins uniform to date, and looked like he was about ready to punch himself in the face in frustration. He delivered 6 2/3 shutout innings, but appeared to be in no way satisfied with the way things ended. I think that’s a good sign. Lynn left the mound shaking his head and screaming into his mitt. With two outs in the seventh inning, he hit a batter on a first-pitch curveball. With Lynn approaching 100 pitches, Garvin Alston went out to the mound for a brief visit. I’m guessing the conversation went something along the lines of “this is your last guy, so give him everything you’ve got left.” Lynn walked the next batter on four pitches for his only free pass issued of the night. It was a pretty intense show of emotion that followed, the kind you rarely see in a regular season baseball game. I loved it. Lynn has obviously had his struggles, but this Twins team just seems to be lacking an edge thus far in 2018. Injuries have taken a massive toll, but I also think the club has been a bit flat. Ryan Pressly came in and got the final out of the seventh, finalizing Lynn’s line at 6 2/3 innings of shutout ball with five hits and four strikeouts. His display of emotion seemed like it may have also helped awaken the offense. Already up 3-0, the Twins’ bats put together a great bottom half of the seventh, tacking on three more runs. 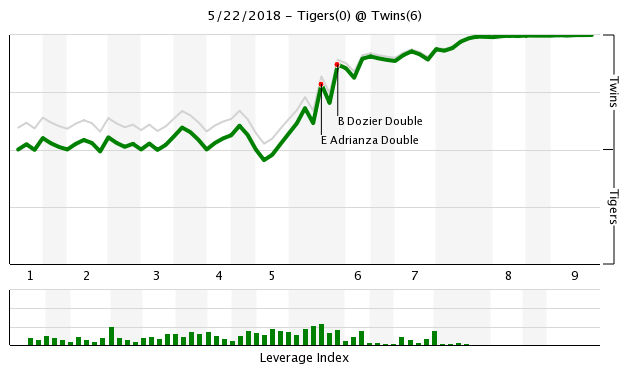 Along with Lynn’s performance, another great sign of things to come (hopefully) was a great game from Brian Dozier. He drove in a pair of runs on a two-out double in the fifth inning and added an RBI double in the seventh. Ehrie Adrianza was 2-for-2 with a walk, two RBIs and two runs. Zach Duke and Matt Magill each pitched a scoreless inning out of the bullpen. The Twins had opportunities to score even more runs, but they had two runners thrown out at the plate. Adrianza was caught trying to score on a wild pitch in the third inning and the Tigers got Logan Morrison on his way home on grounder hit to the third baseman. I always believed in Lance Lynn. Never doubted him for a second. Named my newborn son Lynn, that's how confident I was. Lynn sure got worked up in the dugout when he was taken out of the game. It was good to see. So much for these guys just play for their paycheck. It's also nice to see Buxton looking like a baseball player at the plate. More please. I agree with Lynn being fired up. Great to see. That’s the kind of passion I want. Nice job by the twins feasting on the lesser opponent so far. Nice job Lynn.Also, nice job Pressley. Just from a building confidence level, having 6 plus innings of shutout ball is a lot different than getting credit for two earned runs if Pressley had given up a few hits or a homer. It was out of Lynn's hands either way but something uplifting about a shutout.I hope this is a sign of good things to come rather than an aberration. Interesting to see Dozier hitting oppo doubles. SSS coincidence, adjustment, some mix of both? These longer starts are really nice to see. Cleveland has played 2 more games than the twins and have 0 relievers with 20 innings pitched. The twins have 4. Relievers aren't built for this much work. The Twins have solid rotation depth +Santana+Gonsalves. Put May in the bullpen and have him pick up the 1+ inning appearances. He'll take some strain off the bullpen and add value right away. Landing him in AAA would be a waste. Good for Lance Lynn and the Twins. Both needed this today. On a similar note, my wife wants to have Lynn's baby. Yup - I've been hard on Lance, but will give him credit where credit is due. Cutting down on the walks is HUGE for him. Great game by Lynn, but he needs to follow it up with another good start against KC. Dozier had a plunked RF double the other night also on a pitch you could barely reach with canoe paddle. Hopefully he has changed his approach and keeps it up. It appears his days of up and in FB's are over and they would rather walk him with stuff off the plate. He has been particularly susceptible to high outside breaking stuff. That said, the guy the Twins need more than Dozier or Sano is Buxton. He is absolute havoc on the bases, if he gets that far. Lynn gives a good interview. Deflects questions without being a jerk about it. Now that he doesn't have the specter of Phil looming over him, he relaxed a bit and pitched better. I like the fact Lynn showed some fire and was open about his dissatisfaction with his previous outings. Hopefully, this will lead to better things down the road. This is the Lynn we all signed up to see pitch. About damned time he showed up. I agree Buxton is the guy.Dozier's days of up and in FB's are not over if he shows once again that he can punish the balls on the outer half. Again, its not that he shouldn't pull the ball, its that he shouldn't try to pull every ball..I think Buxton needs to think opposite field a little also for a different reason.His swing is too quick and he seems to be in front of the ball a lot. Nice to finally see him try a bunt again. (singing) "There's nothing going on but the rent. You've got to have a J-O-B if you want to be with me." (Paraphrasing now) Women love that song, but it's so cold-blooded. "Hey baby, what's going on? ""THE RENT. That's what's going on. You got a job yet? ..."
I would like to see more passion while the player is still in the game. Easy guys. We're on thin ice here. Hopefully this means Lynn is finally getting into shape and we'll start seeing this sort of performance a little more often. Nice to see the defense helping out in turning the DP last night too, several very nice plays out there to erase any potential rally. I'm very happy to see the Twins bringing their pitching staff back down to a much more sensible 12 man group. The rotation is going well enough that we don't need frickin' 8 guys in the bullpen and the additional bench bat is especially important as the offense has been scuffling a bit with guys being injured/out. All the STL press talked about with Lynn was that he's "a personality." Hopefully we get to see some of that soon, instead of talking about all his bad outings. I'm a Cardinal fan.My impression of him is that he is what they called back in the day "a red a$$".He's a bulldog that doesn't like to miss a start or come out of the game if he thinks he's still throwing well.I think it's good to have a guy like that going out there every 5th day.I'm kind of shocked that he's struggled so much.He's not an ace/#1, but he's a professional pitcher. The only way these toothless Tigers should beat you is if you give up too many walks which has been Lynn's downfall.Good first step. Another good start. And the bats got timely hits. Winning is good. What's There to Say About Ehire?